Koh Phangan is the largest in a small archipelago of six islands and lies to the north of Koh Samui in the Gulf of Thailand. This idyllic island is known for its pristine white beaches and its infamous Full Moon Party, which brings party-goers from around the world together to experience one of the biggest beach parties around. Salad Beach Resort is located on idyllic Haad Salad, a pure white sand beach in a picture perfect bay with all the trappings of tropical island life. The resort is set amongst beautiful tropical gardens and is right on the beach, harmonizing with the wonderful natural surroundings and making Salad Beach the perfect place to spend your dream holiday. 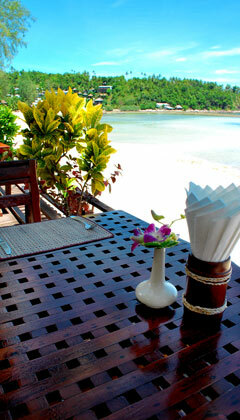 Salad Beach Resort welcome you to paradise of you holiday. You will stay in a peaceful nature Salad Beach Resort offer 28 rooms in luxury hotel and 26 rooms in bungalow; all equipped with air condition, fan, bathroom with hot and cold shower, satellite TV room service, safety box and refrigerator.